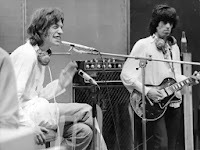 Bobby Owsinski's Big Picture Music Production Blog: At Look At Recording "Sympathy For The Devil"
If you ever wondered how songs were worked out and recorded back in the 60s, then this video is the best example you'll ever see. 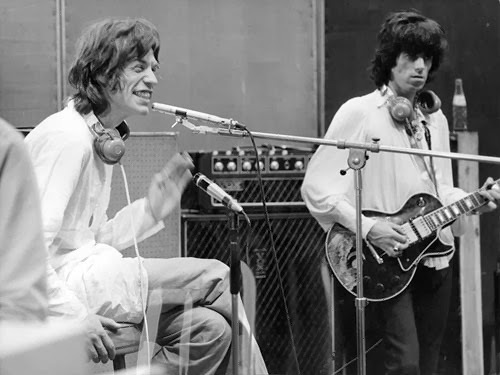 It's a look at The Rolling Stones first working out their famous "Sympathy For The Devil," then recording it, way back in 1968. The film, called One On One, was shot by French New-Wave director Jean Luc-Godard at Olympic Studios, then largely forgotten. In it you'll see The Stones learning the song, then trying different versions until they hit upon the one that we know today. They then begin to record it for real, in which you'll see the entire band performing at once. The vocal overdubs are interesting as well, with Jagger singing on one side of gobo and the group background vocals on the other. You have to watch a 15 second commercial to get to the video, but trust me, it's worth it. Brilliant stuff, thanks Bobby. Proof again how and why true talent actually works and earns its longevity. Also proving that a good song doesn't have an expiration date. Fascinating video. It was really cool to see the band work through the song and how they were set up in the studio. What's really cool about this, though, is that it's a perfect demonstration of how a change in the arrangement can take a song from mediocre to great.